Ireland is often a green and misty land (although less greener than usual during this cold winter). And one of the things that surprises visitors is the sight of “palm trees” incongruously raising their mop tops through the Celticky fog. They decorate our towns and suburbs, they are blasted by the salt air on our seafronts, and they are often seen in pairs guarding the entrances to farmhouses. But, they are not palm trees at all: they are the New Zealand native, Cordyline australis. They enjoy the common name of “cabbage tree”, supposedly because settlers in New Zealand found the young leaves to be a tolerable substitute for cabbage. Cordylines are much loathed. Partly it is because of the occasional and near-indestructible leaves that the trees shed (dried, they make great kindling) and partly — I think — it is because they have both lowbrow and suburban associations. It’s not unusual to see them sprouting out of a jolly carpet of summer bedding. In other words, in the eyes of a certain kind of refined gardener, the cabbage tree is a shining example of bad taste. One of the first things that cordyline-haters do upon inheriting one in a garden, is to hack it down to the ground. The trees are unfazed by such insults, and regenerate eagerly, popping out several stems in the place of the previous single one. Good for them. This winter and the last, though, have not been kind to cordylines, and the inland parts of this country are littered with their still-standing, but mummified, corpses. I fear they may not rise again to annoy the better classes of gardeners. Where I live, however, all these misunderstood New Zealanders are in the pink of health. Our barometer has not dipped lower than minus 5 degrees Centigrade (23 F), whereas elsewhere in Ireland, the temperature was ten or more degrees colder. In our mild climate, the cordyline blooms every year. The angular panicles are crammed with creamy flowers, which open in late spring, and go on for weeks. The scent — strongest in the evening — is powerful and lily-like. For me it is one of the exhilarating fragrances of early summer. Bees would seem to agree. They love the flowers, and work them all day. And in the autumn and early winter the thousands of ivory-coloured berries, which are full of fats, help to keep birds alive. My neighbours’ tree across the road is a busy re-fuelling point for blackbirds, thrushes, starlings, blackcaps and wood pigeons. If you don’t like cordylines, or if they don’t do well in your colder area, then — as we say here in a very self-righteous voice — I’m sorry for you. And you’re not likely to be interested in knowing that they belong to the same family as asparagus, Asparagaceae, a clan that also includes lily-of-the-valley and hosta. Isn’t it mostly that they can look so out of place? So may depend on the setting whether they enhance or detract. In the Irish countryside I imagine they’d be an eyesore? I think New Zealand and Australia have same kind of issue with characteristically (by association, perhaps)British plants. Kathryn, that’s interesting about the thicker trunks. And it makes sense, of course. Anne, I think they look well in a jungly border. And I also love to see them in seaside gardens because they look so festive and holiday-ish. 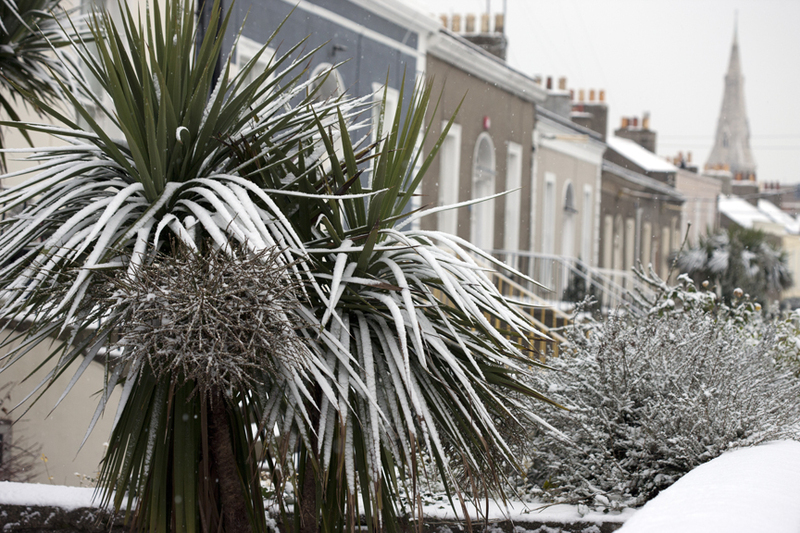 There are going to be a lot less cordylines in Ireland and the UK after these 2 harsh winters. But I hope that people still plant them in mild areas. Certainly, the countryside is better off without them where they stood out like sore thumbs. Thanks goodness for the occasional dreadfully cold winter to bring us back to what is normal and natural for our gardens. Eddy, that sounds sad. But perhaps it’s not terminal (see super-knowledgeable gardener Kathryn Marsh’s comment above). Helen, I agree with you. I don’t like them in summer bedding. Paddy, begging your good pardon, I don’t entirely agree with you. And we could talk about “normal and natural” all day. But I have a sentimental attachment to cordylines. My family moved back to Ireland when I was five, after having lived in Minnesota for some years. 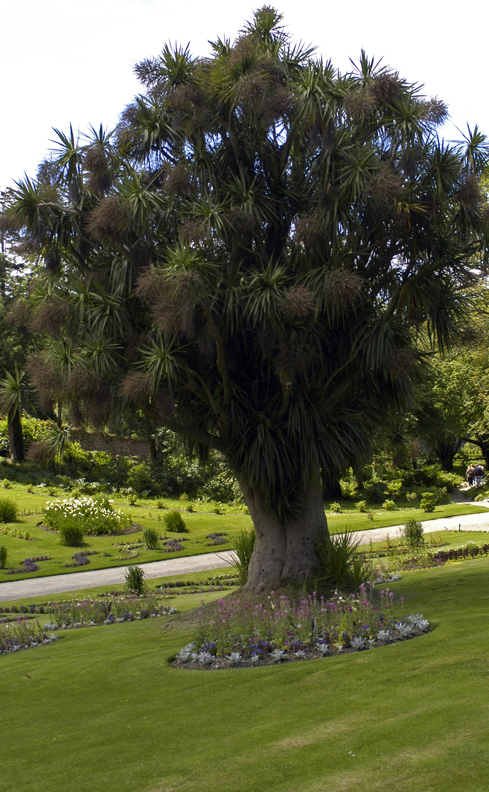 Greystones in Co Wicklow, where we moved to, was full of cordylines. After the pines, oaks and birches of Minnesota, I thought that the “palms” in Ireland were tremendously exotic. I had one – kept falling over in the garden as it must not have rooted deep enough. Last winter put it out of its misery and now I look at them differently – will never again purchase frost destructibles. Glad you mentioned the scent Jane. My parents have one in their garden in Wicklow (up in the mountains and still in rude health after the freezing winter [including my parents in that as well as the tree]). The upper part is right by a bedroom window, and when you sleep with the window open, and when it is in bloom, the smell is intoxicating and gorgeous. I know people think of them as somewhat tacky or vulgar, but I think they are great. Grown as understorey in places like Mount Usher they have quite a different vibe to the solitary suburban specimen. When I was growing up my grandparents has a Cordyline in their front garden. That was long long ago and then it was exotic and a mystery to us all. We did not know what it was & neither did they. It flowered and fruited each year and the fallen leaves made wonderful play-things. As we grew up & learned more we were able to identify the plant and eventually as a landscape architect and a garden designer I no longer liked the things, along with phormiums and didn’t care to use them. Fashion perhaps leads to over use and dislike sets in. In any event the Cordyline, while possibly being a plant I no longer want to socialise with, does hold good memories of a time when it contrasted with traditional beech hedging, daffodils, roses and tiny front lawns & provided a talking point for adults and roofs for south sea island dwellings for children. The first Cordylines were brought to Ireland in the 1930’s, by Mr Nicholas J Kelly, grandfather to the present owner of Kellys hotel Rosslare, Bill Kelly. He imported the first specimens from France. 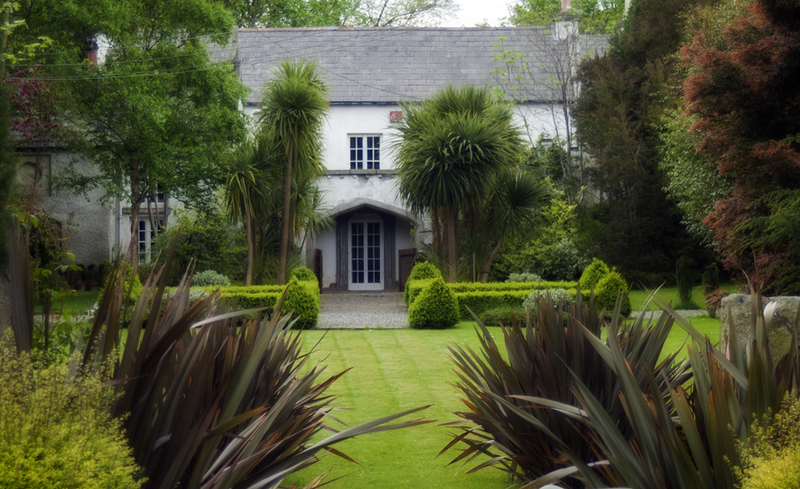 To this day, the Cordylines take pride of place in the beautiful seaside garden in Kellys Hotel. You are currently reading Coming up Cabbages: a few words on Cordylines at One Bean Row.